Custom Keyrings. Leather Keyrings UK Printed And Made. Real Leather. Give your keys something chic to hang from, with custom keyrings designed by you. Made from supple Italian Nappa leather of faux leather, these lightweight custom keychains are printed, cut and sewn to order by our skilled craftsmen. Create a design for the front and back of the keyring, which has all the distinct characteristics of natural leather. Colours are beautifully saturated and fine lines depicted crisply. Your new keyring is completed with a smart silver coloured ring, which is easy and simple to attach keys to. The final result? 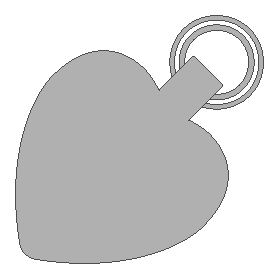 A unique and stylish keyring that you will love for years to come available in either a classic rectangle or a heart shape. Chic, elegant and undeniably functional, these custom keyrings are double sided to show off your artistic talent. Made from real Italian Nappa leather or warm leatherette, which is renowned for its beauty and lightweight nature, your new keyring is handmade in London just for you. Thanks to the natural qualities of the leather, every keyring is unique with all the charm that comes from using a natural material. Grainy textures, small pock marks and other distinct leather attributes may be apparent. The generous size of your custom keychains makes them easy to locate in deep pockets and bags - an annoyance we are all familiar with. Our specialist printing process creates a print that is of superior quality and highly detailed. Colours are vibrant and fine lines crystal clear. Your keyring is available either in a classic rectangular shape or a beautiful heart shape, with a choice of four stitching thread colours. Once you have uploaded your designs onto the online platform, they are checked over by the quality control team. When the designs are given the green light, our production teams get to work. Firstly, the print technicians print your designs onto the beautiful Italian leather or faux leather. It is then passed onto our craftsmen and seamstresses, who carefully cut the leather and bond both sides together, with a spongy neoprene layer in the middle, before stitching it all together. The classic silver coloured rings are the final addition to your leather photo keyring, and it is ready to be checked and sent directly to you. As with all natural leather products, care must be taken with cleaning. If you find your custom keychains are a little dirty, give them a wipe with a damp cloth. Remember that leather naturally ages over time, so you can expect it to break in after its initial uses. This will result in minor, very subtle creases on the surface, and some minor discolouration where the rings sit. These keyrings look beautiful with anything from photos to original artwork and typography printed on them. As they are double sided, you have twice the space for getting creative. If you are considering a design that has fine details or text, please remember that there is a slight bleed area, where the stitches are made around the edges of the keyring. To avoid distortion, place important aspects of the design in the centre of your artwork. Great product Vegan faux leather key rings which are finished to a great standard. As always great service. Great! Good quality, nice materials, great colours and print, really fast delivery. Whether you are constantly losing your keys at the bottom of you bag, or are just looking for a stylish new way to keep them together, designing your own faux or real leather key fob is just what you need. 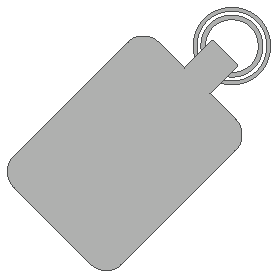 The keyring measures 70 x 57mm, with a chunky silver ring for your keys. So it is the perfect size to stand out in your bag, making it quick and easy to locate. Create an original design by uploading original artwork. You can design the front and back of your keyring, making it completely bespoke to you. Faux or real leather keyrings UK made make smart, stylish and functional gifts. For car sellers, why not offer your customers a small gift when they purchase a car? Design your own keyrings with your company's name, contact details and logo and we will print them onto the smart leather or warm leatherette. Attach their new car keys to the chic leather keyring, and they will be able to show off where they purchased their new car from to all of their friends and family. It's quick, it's easy and it is certainly memorable. If you are a designer or artist and are about to show your works in a gallery or exhibit, then these custom keyrings are ideal for gifting or selling at your event. Upload your artwork on these chic and original keyrings and offer them to customers and clients (old and new) as a gift to thank them for their support. You could even sell them at your event, as a way to encourage potential clients to support you. If someone purchases your work, add a keyring as a thoughtful and artistic freebie. What are custom keyrings made from? Your new keyring is made from stunning Italian Nappa leather or faux leather. This beautiful leather has natural characteristics, including visible grain, which become more apparent as the leather ages. There is a spongy layer of neoprene in the centre. Are the leather key fobs made in-house? Yes they are. Leather keyrings UK printed and made are one of our specialities. The key fobs are printed by technicians, and then cut, sewn and finished by a team of seamstresses. How quickly can I receive a leather photo keyring? You can receive your custom keyrings very quickly. If orders are received before 12pm, they can sometimes be made on the same day. We also offer next day delivery. Our team of super talented #ContradoCreatives have created this exclusive range of designer leather keyrings. Each one is handmade and features their own original artwork. Leather Keyring = Amoeba Skyline! Leather Keyring = Amoeba Aurora!